It is the kitchen and bathroom that will deliver the most increase in value from a renovation project but you always have to keep in mind the home and property, and the location. Whether or not “high specification” adds value varies. 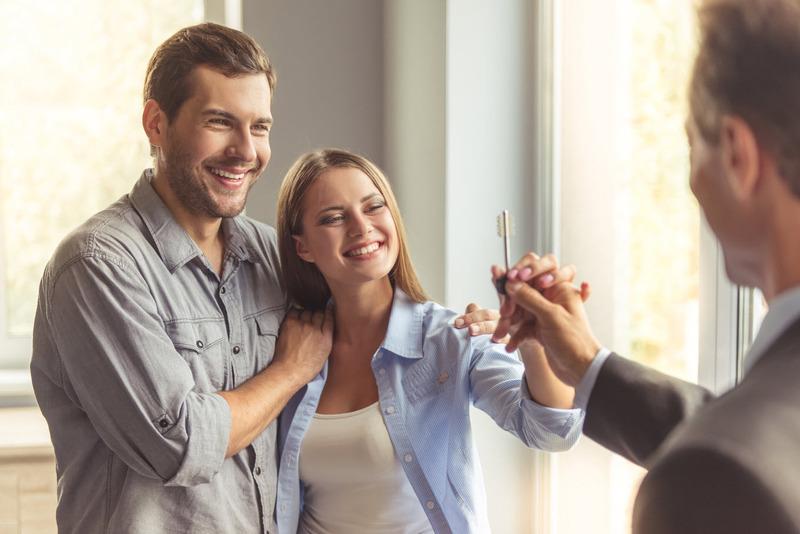 If you put in a $30,000 bathroom or kitchen, whether it will add the same amount of value to your home as you spend depends on the home and the neighbourhood. The kitchen and bathroom are a good place to spend money but you can overdo it. Spending money on kitchens and bathrooms will usually add value to a home. But if you want to know whether to spend $10,000 or $30,000 on your bathroom makeover you need to consider the overall value and location of your home. On a higher priced property you are likely to add at least the value of a ‘high spec’ bathroom but at the lower end then you might be better to spend $10,000 instead. A modern kitchen that doesn’t break the bank will still add value to a home. But if you spend $40,000 on a kitchen in a modest home, you may not get the same value back. What about insulation and heat pumps? Insulation and heat pumps are expected today. If your home does not have insulation or heating it may detract from the value so this is a good investment and will usually add some value. Solar panels could result in an increase in value but it is difficult to quantify because cost and value are not the same. You also need to consider what benefits the solar power brings and whether these benefits will be returned over a long or short period. Tidy and well presented landscaping can add a significant amount of value a property. However it may not be a direct relationship between value spent and value added. The added value of well-presented landscaping is generally on the overall saleability of a home through increased street appeal/utility. It is a great way to get potential purchasers through your home on open homes. In regards to how much should be spent on landscaping, it really depends on the overall value level and type of property. The market expectation of the level of landscaping in a high value suburb is significantly greater than that of a lower value suburb. The nature of the property can also dictate the nature of the landscaping and site development utilised. For example if you own a high end character villa you ideally want to keep that timber picket fence out front rather than replace it with something more modern. Property owners should consider the nature of their property and the wider neighbourhood before commencing any major landscaping works. An example of this could be replacing timber joinery in a villa/character bungalow with modern aluminium joinery as this does not enhance the character and detracts from the value. Does new carpet and a new roof add value? These are generally considered as on-going maintenance costs. From a valuation point of view the focus is more along the lines of what would it cost to rectify any issues caused by not maintaining items of this nature rather than the value that they may add to your property. Because carpets are a chattel, generally they won’t add value but will maintain value and help with saleability. Your roof falls under repairs and maintenance. The roof on a house is expected to be functional and do its job. You will lose money if leaks otherwise it is just a cost. You wouldn’t do it unless it’s needed. As long as the roof of the dwelling is well maintained, functional and in reasonable condition, you will not add huge value by putting on a new roof. But if the roof is leaking and does need replacing then this will detract from the value of a home quite substantially so it is worth renewing your roof if it needs replacing. Does a garage add value? The added value of garaging is also very dependent on the locality of the property. In areas which have larger land sites and generally more space, a new garage may not add much in value. However, in inner city suburbs where land is at a premium and the lots are much smaller and off street parking is scarce, a garage could add a significant amount of value to your property. 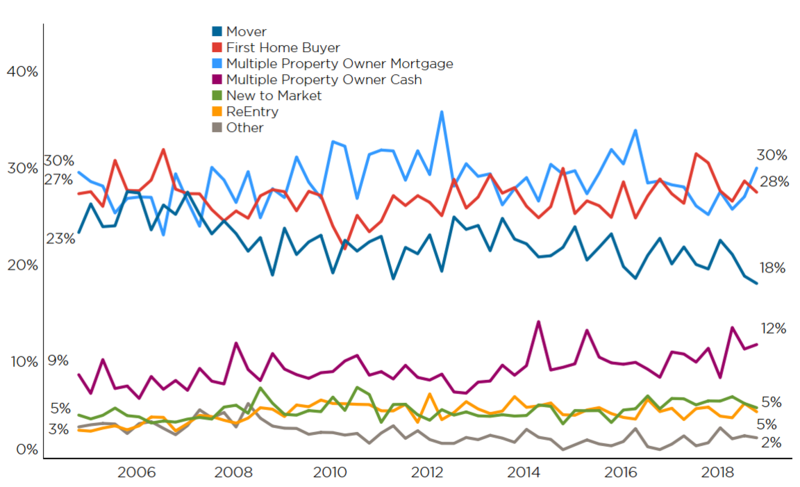 In the first quarter of 2019, first home buyers (FHBs) and mortgaged multiple property owners (investors) each accounted for 24% of property purchases. For a long period of time, investors had a much larger market share, but LVR III (40% deposit) dampened their activity from October 2016 and meanwhile FHBs have slowly and surely kept raising their presence. This is not to say that there is always direct competition between the two groups, or that an investor buying is always locking out a FHB (or vice versa). But it’s still interesting that their market shares are similar and these may well continue to be the two groups to watch for the rest of 2019. 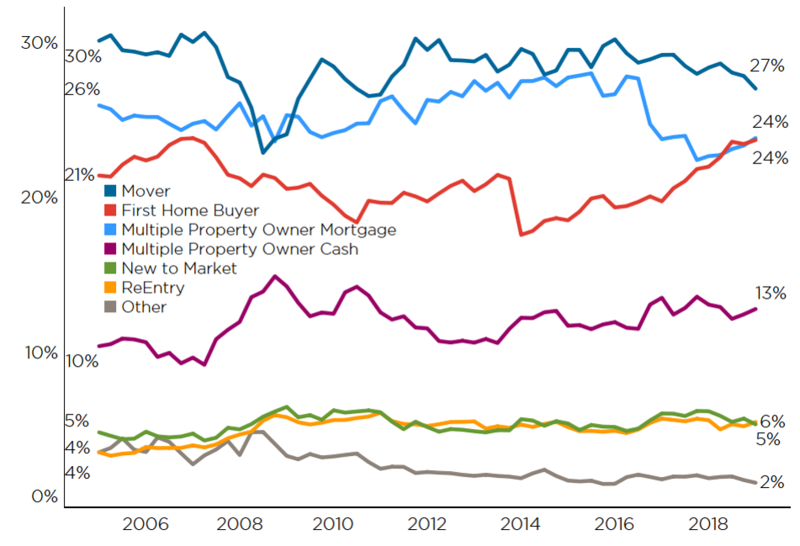 The Q1 data for Buyer Classification is now complete and it confirms that ‘movers’ (existing owner occupiers) are less active than in the past, with first home buyers (FHBs) and mortgaged multiple property owners (MPOs) the key groups of interest at present. Over the first three months of the year, ‘movers’ accounted for 27% of property purchases, which is down a touch from 28% a year ago and from 29% in Q1 2017. With the next step up the property-buying ladder still hard to achieve – e.g. due to the transactions costs (legal, estate agent), as well as any extra equity/debt required – it’s not really surprising that more movers are happy to stay put, and perhaps renovate instead. Meanwhile, as the first chart shows, the gap between FHBs and mortgaged multiple property owners (MPOs, or investors) remains tight, with both sitting on 24% of purchases in Q1 (albeit at one decimal place MPOs are slightly ahead of FHBs, at 23.9% versus 23.7%). From the LVR III-induced trough for mortgaged MPOs of 22% in Q4 2017, they’ve slowly crept back into the market on the back of more finance becoming available again. And their comeback is despite several new rules from the government which have raised costs (e.g. extra insulation, changes to negative gearing). 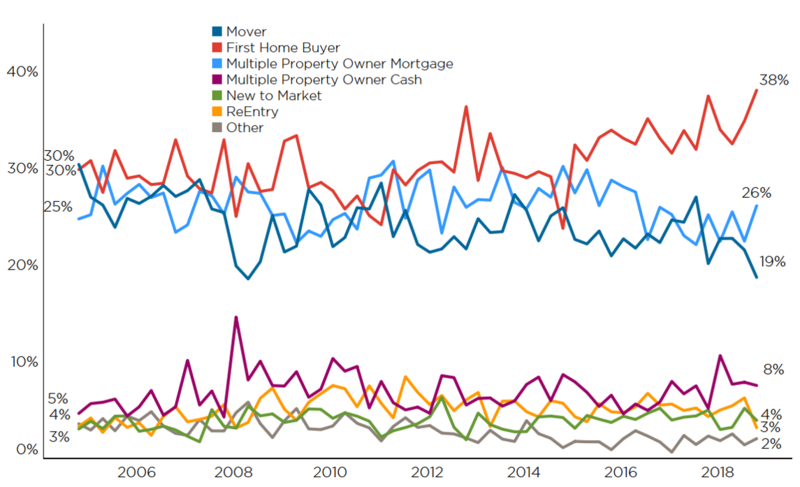 For FHBs, although the strong upwards trend from 2014 to mid-2018 has flattened off in the past 3-6 months, their share of purchases is still high in an historical context. The ability to tap their KiwiSaver funds for a deposit, alongside a willingness to compromise on location/property type, are key factors keeping FHBs’ share of purchases high. CoreLogic figures show that as part of that compromise, FHBs are entering many markets around the country at prices 15-20% lower than the area’s average. The national patterns largely apply in Auckland with movers relatively quiet and mortgaged investors ‘hanging in there’. What is an interesting aspect of the Auckland market at present is that despite average values being >$1m, FHBs are not just a strong presence, but they’re actually the largest individual buyer group with a 27% share (see the second chart). 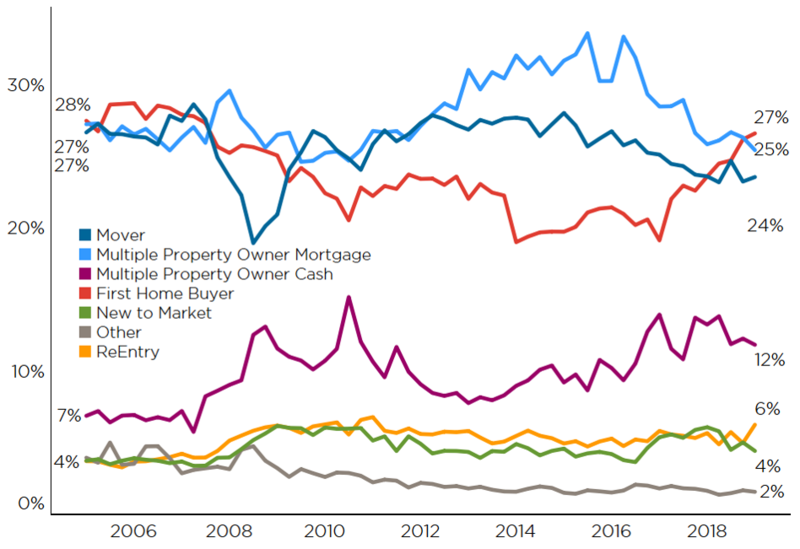 It’s a similar story in Wellington too, albeit in the capital mortgaged investors have perked up lately and their share of purchases (30%) has risen back above FHBs (see the third chart). Although FHBs still have a decent presence in Wellington City, one clear option for those priced out is to purchase in the Hutt Valley and this is something that’s often heard about anecdotally. 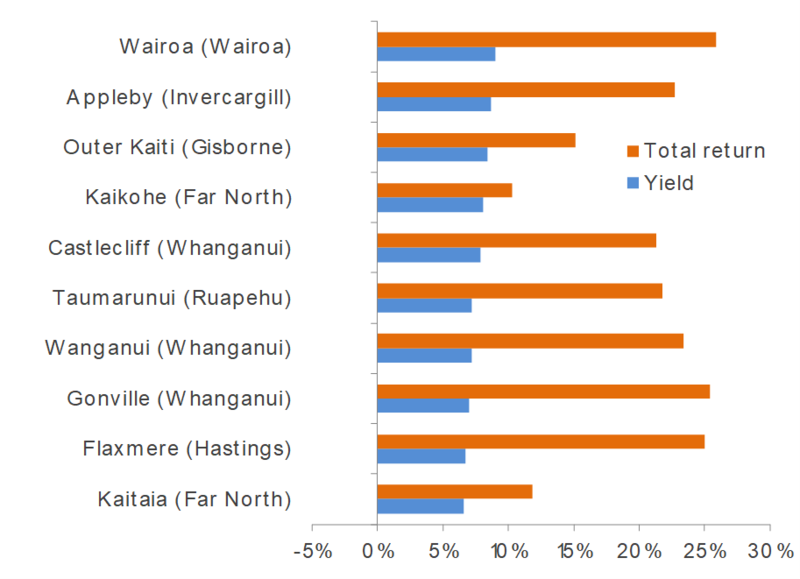 But our stats illustrate it emphatically – as the fourth chart shows, FHBs have a very strong market share in Lower Hutt (as well as in Upper Hutt and Porirua). NZ Property values have grown by only 0.5% this calendar year, with the annual rate of growth slowing to 2.6% at the end of last month. According to the CoreLogic QV April House Price Index results, Auckland values continue to fall, with the index dropping 0.4% in March. 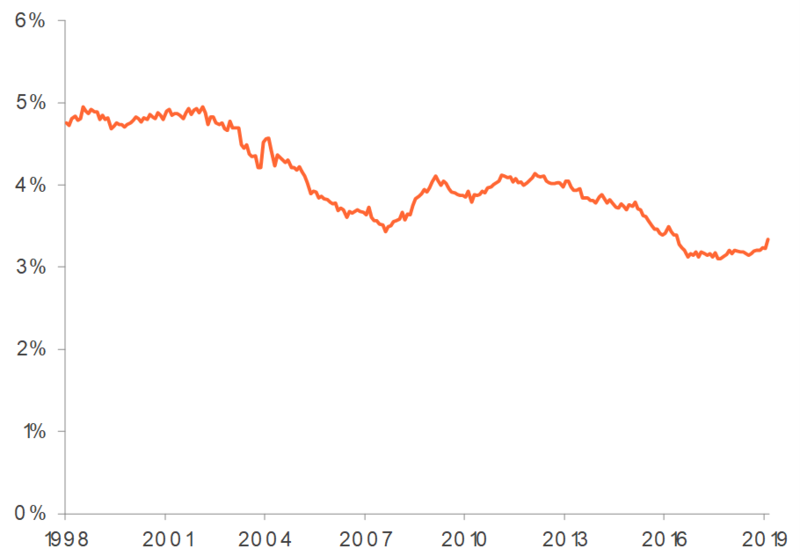 This takes the annual figure to -1.5%, which is the biggest annual fall since the Global Financial Crisis 10 years ago. For full context though it’s worth noting that aside from minor monthly fluctuation, values have effectively plateaued for two and a half years now and across the Super City the average price is still higher than in September 2016. This is when the property party in Auckland essentially stopped, with funding considerably tightened, both by way of higher loan-to-value ratio requirements and more stringent bank expense testing. 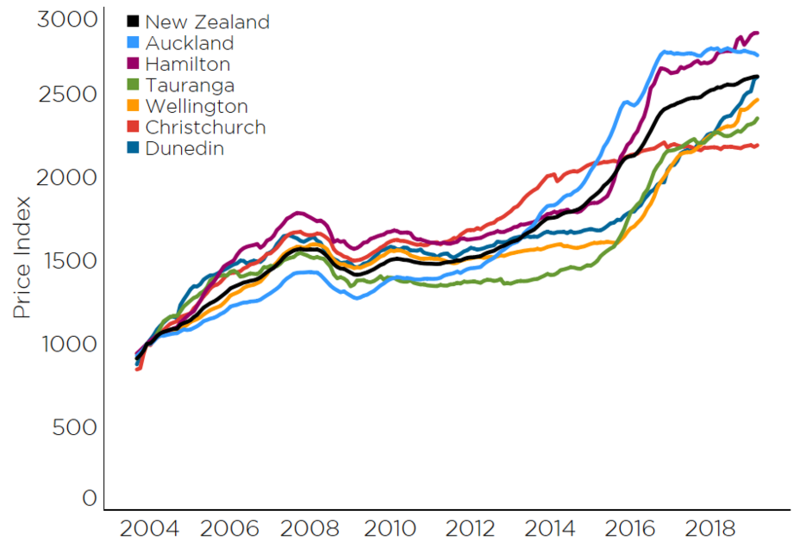 Similarly, nearby Rotorua bucked the trend of general moderation in growth among the other main urban areas with annual growth surging to 12.6% from 9.4% at the end of February. The most interesting development in relation to the property market over the last month was the Reserve Bank’s change of stance on the potential future of the Official Cash Rate (OCR). 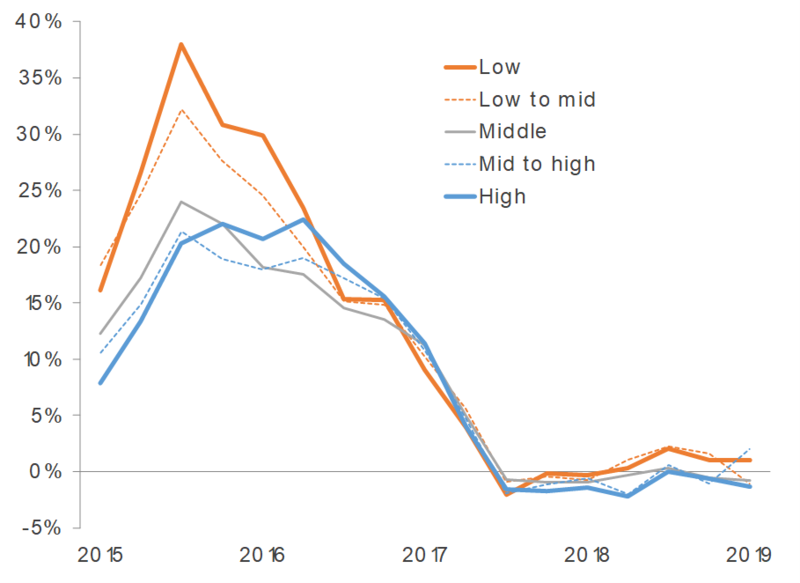 The introduction of the sentence ‘the more likely direction of our next OCR move is down’ as part of their release last month came as a surprise to many commentators and is good news for current and future mortgage holders. 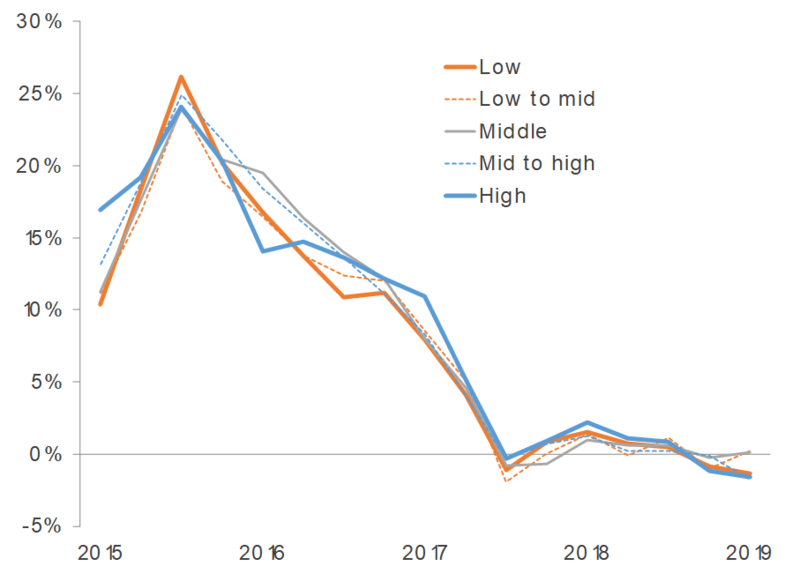 The OCR is only one factor influencing mortgage interest rates, and it’s unlikely they will fall any further off the back of any OCR drop - due to other bank funding costs, but it does push out the horizon for a potential increase. This provides more certainty for those owners currently paying a mortgage, likely at very low interest rates. And it may also guard the Bank against the probably of rates rising if and when they increase the capital requirements of the retail banks. 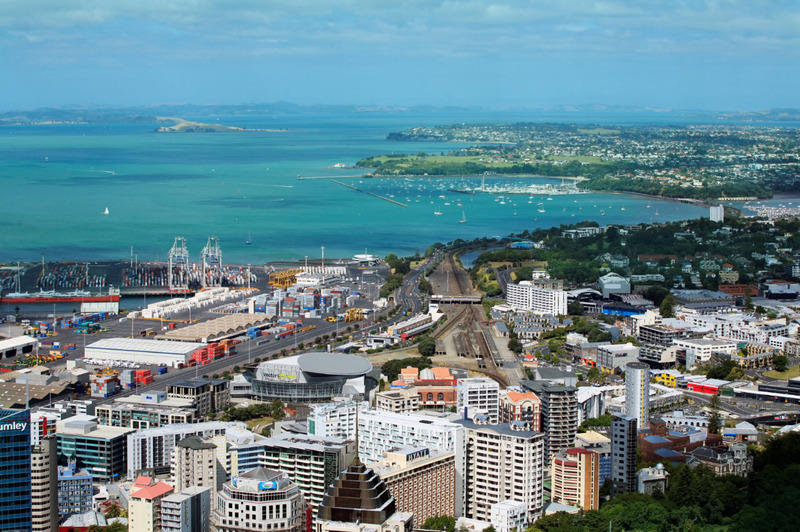 The detailed House Price Index results reveal where the weakness in Auckland is most keenly felt, with the more expensive Coastal North Shore (average value 1.36m) seeing a 4.1% drop over the last year. 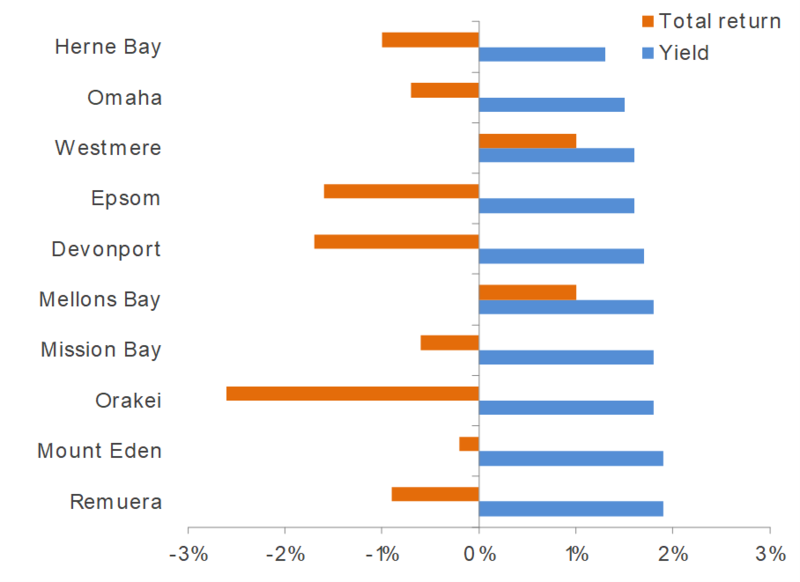 Meanwhile for the Onewa area within North Shore (average value $963k) values decreased by only 0.8%. 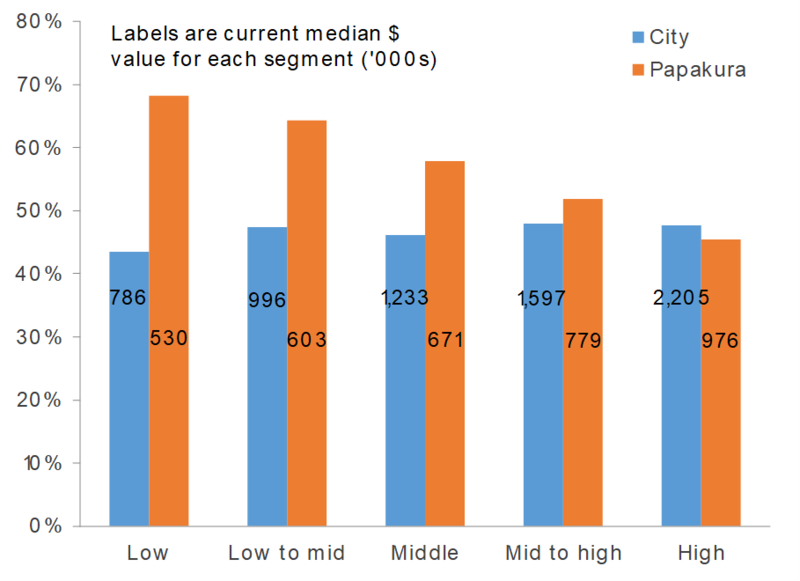 There’s a similar split in the old Auckland City area, with the more expensive eastern area, (including Remuera and Epsom), with an average of $1.54m, decreasing by 1.6% annually compared to a 0.4% drop in the ‘cheaper’ southern area (including Mount Roskill and Onehunga) with an average value of $1.09m. In the east of Manukau (average value $1.14m) the trend continues as values here are down 2.0% in the last 12 months compared to a minor drop of 0.3% in the North West (average value $777k). 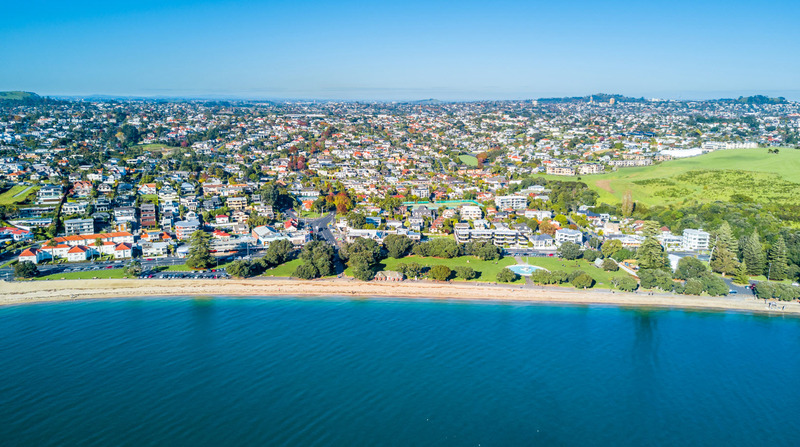 The Hibiscus Coast, with an average value of $928k, is the only part of Auckland to see growth over the past 12 months (0.9%). Elsewhere, the inconsistent growth in both Hamilton and Tauranga has continued, with Tauranga experiencing a stronger March but longer term more constrained growth. A modest rate of 3.7% annual growth epitomises the last 18 months when the annual growth rate has bounced around between 1% and 5%. In Hamilton the annual rate picked up in September 2018, has moved between 4% and 6% since, and ended March 2019 at 4.5%. 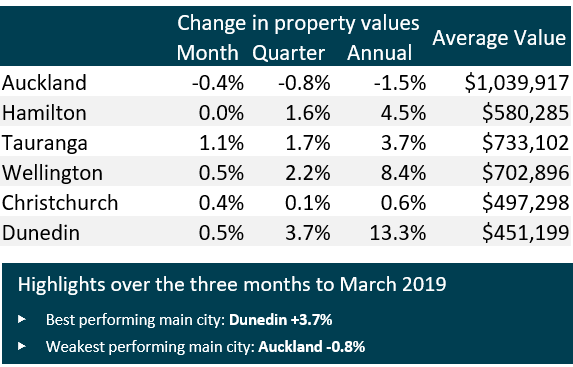 In Dunedin, the annual growth rate of 13.3% remains the highest among the main centres, however the rate of growth did slow from 14.3% the previous month. Property values in the wider Wellington region have recently seen greater growth than the other main centres in the North Island and that held true according to March’s index, with the annual rate shifting sideways to 8.4%. 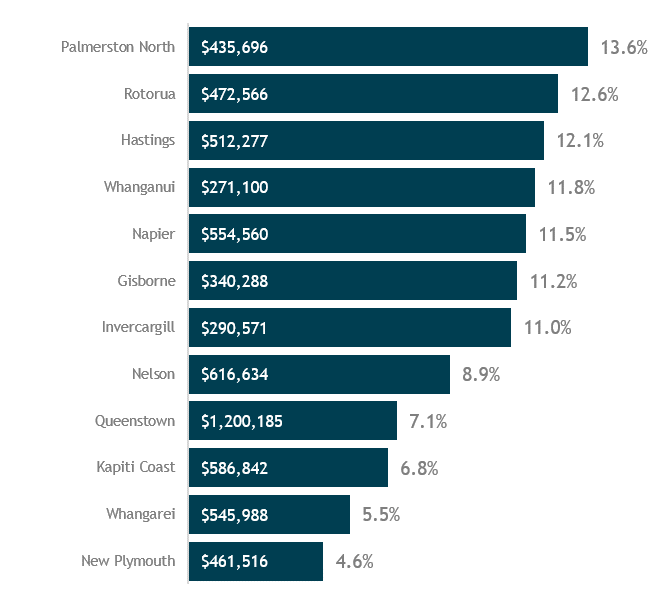 Within the region the more affordable Upper Hutt City (average value $$542k) has seen the greatest growth over the past 12 months, at 12.3%. 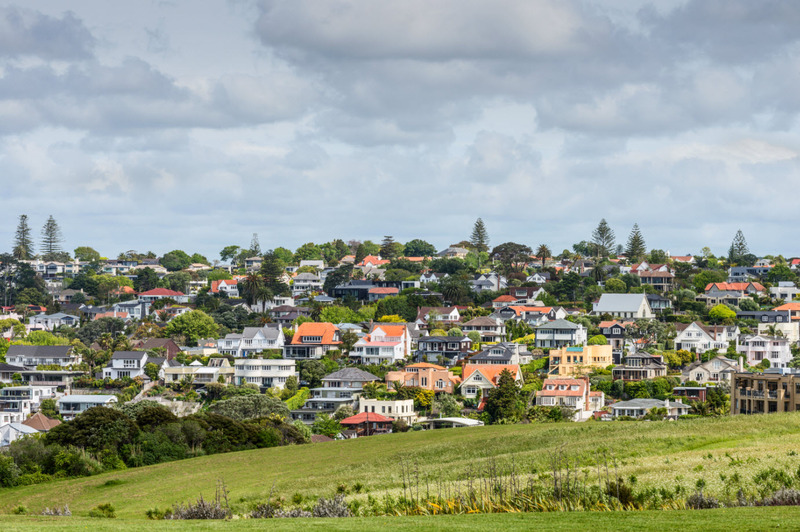 Further north in Whanganui, property value growth appears to have run out of steam with values in the first three months of 2019 dropping by 2.0%. 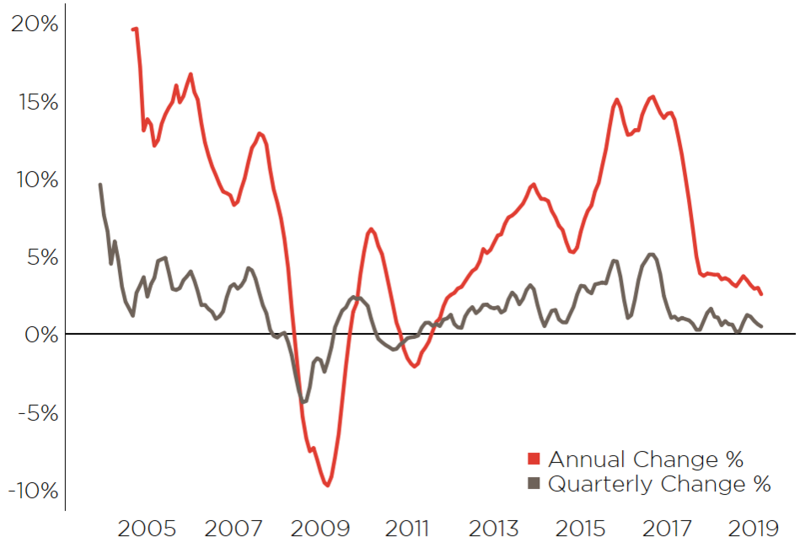 This has eaten into the significant growth experienced throughout much of 2018, however the annual growth rate remains relatively high, at 11.8% to the end of March 2019. 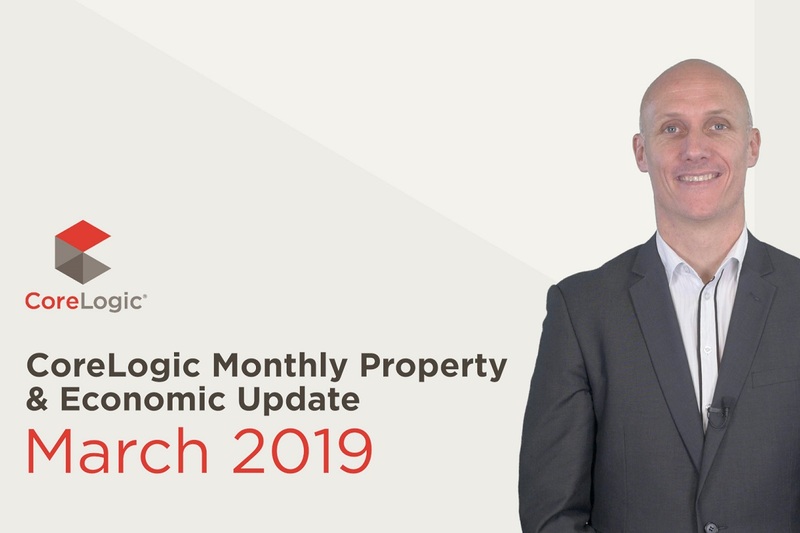 “Not much changed from the prior month in terms of property value change, however the wider property market environment holds its intrigue. The proposed ring-fencing rules relating to loss-making residential investment properties are still working their way through parliament, but if enacted will apply for the current income year (1 April 2019- 31 March 2020) so assuming they pass into law they will need to be understood by investors now (although they won’t file their tax position until next year). Later this month we’ll hear the Government’s official response on the Tax Working Group’s Report, with plenty of interest in their proposals for a more comprehensive capital gains tax for residential property. Within the next month we’ll also get our first real insight into the impact of the foreign buyer ban from late last year as Stats NZ release their ‘Property Transfer Statistics’ by NZ tax residency for the first quarter of 2019. We’re expecting to see confirmation of the ban’s effectiveness, which the recent reduction in sales volumes had already hinted at - particularly in Central Auckland and Queenstown. And of course - we’ll then look towards the Reserve Bank’s next OCR decision on May 8. Their foreshadowing of a cut at some stage has many economists predicting one as early as the May date and possibly even another before the year is out. All of this illustrates where our focus remains - on the Government and Reserve Bank as opposed to the usual macro-economic factors (mostly benign) and even international pressures (due to our relative insulation at this stage). 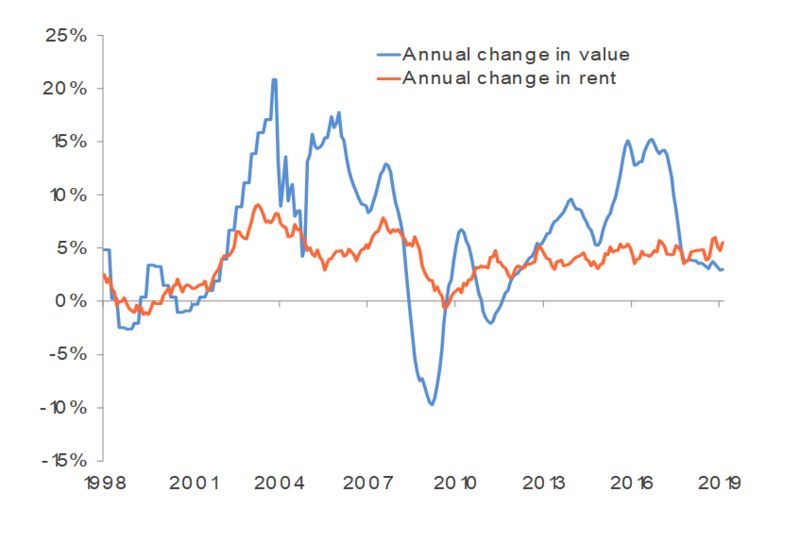 In the end, the outlook remains one of a gradual easing in property values for the rest of the year”.